A look behind the scenes… – Zombies, Run! With development of Zombies, Run! 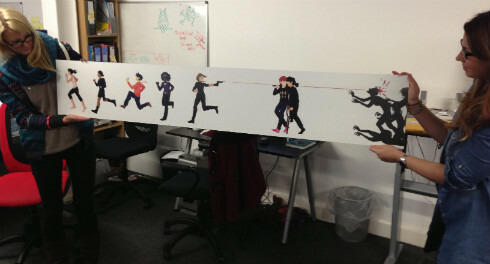 2 speeding along, we thought we’d give you a little insight into how the game gets made. We’ve been in the new office for a few months now and we wanted to share some photos and videos with you guys. Do you remember that incredible piece of Zombies, Run! fan art by TheWonderSmith? We liked it so much we got it enlarged for the office. 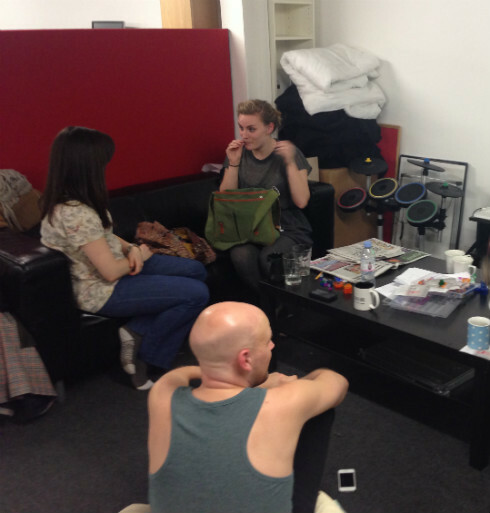 Here it is being modelled by our Office Manager, Sophie, and our junior producer, Georgina. 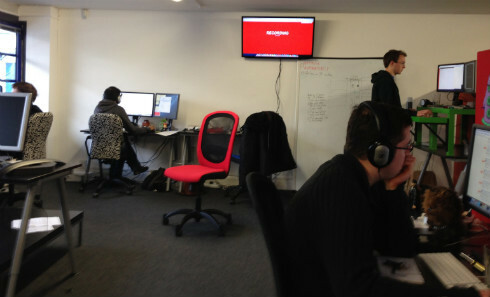 As you can see from the next picture, it has pride of place above the desk of Adrian, CEO at Six to Start. We’ve got a lot of wall space still to fill, so if you have been busy making Zombies, Run! fan art recently, shoot it our way in an email to Jem [at] sixtostart.com. 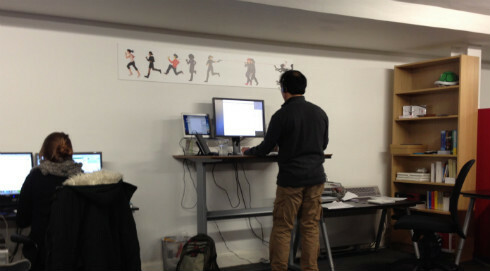 Speaking of empty wall space, we recently set up the Screen to Start. Or the Six to Screen. We’re not sure what to call it. Anyway, the important part is that we have a large, wall mounted display. For important things, like looping videos of a pug licking a window. We also use the screen for silly stuff, like alerting people to the fact that recording is going on. We spent a few weeks before Christmas recording the audio for Zombies, Run! Season 2, so it was pretty handy for letting people know that people are in the sound booth and to keep the noise to a minimum. And we have a sound booth now! It’s definitely an improvement on the ‘bedroom and duvets’ approach used for some early missions! There’s more for us to show you, so we’ll be back in a week or two with more. Next time we’ll be taking a look inside the sound booth, with the incredible voice actors of Zombies, Run! 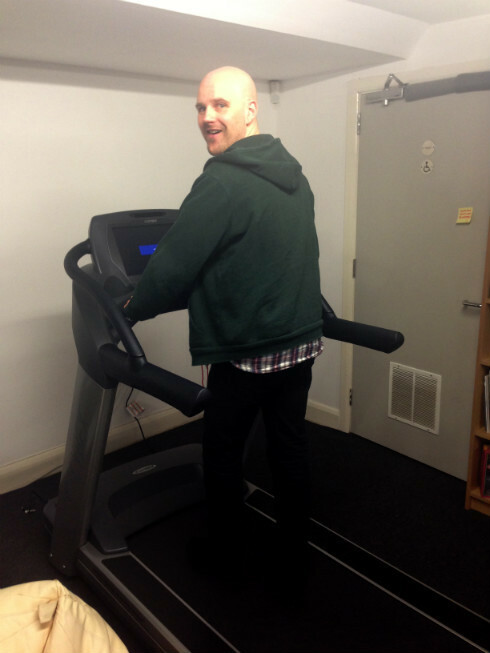 To whet your appetite, here’s a picture of Sam Yao (Phil Nightingale) using our new treadmill between takes. 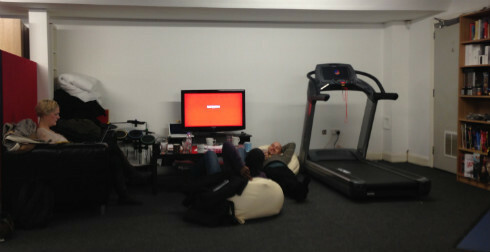 And here are Sam Yao, Archie (Olga Leon) and Runner 3, Simon Lauchlan (Thom Nelstrop) chilling out in the “Actors’ Area”. Located near the kitchen, to better expedite tea delivery. Finally, a few more of our wonderful actors – Runner 4 (Jennifer Tan) top left, Janine (Eleanor Rushton) top right, and Sam Yao, again, at the bottom. 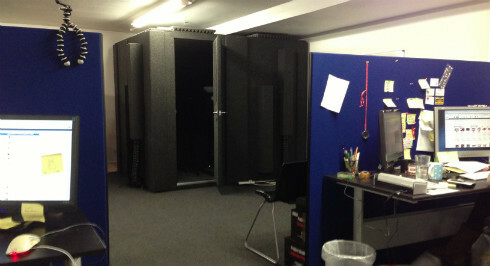 Our look inside the sound booth will include video footage of actual recordings that you’ll be hearing in Zombies, Run! 2 when it releases in the Spring, so make sure you come back and check it out!